The weekend wasn’t glorious – certainly not the weather anyway. But I’ve been really enjoying the delicious summer produce, either from my wonderful food delivery service – Somerset Local Food Direct, from my mother’s garden or from our local pick your own. On Saturday night I had 15 people to supper. We started with broad bean, tomato and mint soup – a recipe I made up as I went along. Although the colour wasn’t brilliant, it looked quite nice with a dollop of creme fraiche and sprinkled with mint. And most of my guests had second helpings so they must have liked it. Next course was lamb, new potatoes, roast peppers, beetroot and orange salad and lettuce with quails eggs. Then a strawberry mush with some rather delicious cake I bought from the school fair.The rain may have been lashing down and the storm blowing outside but summer was still with us. On Sunday the rain was more erratic and interspersed with sunny spells. In one of these we managed to see kestrels, hawks and eagles on display at Dillington – a charity day with hog roast and more strawberries. But there weren’t many strawberries left at the pick your own we went to after that. However, the abundance of raspberries, loganberries and blackberries made up for that. We picked huge quantities to put in my freezer so I can serve them up during the winter months and make milk shakes for the children. 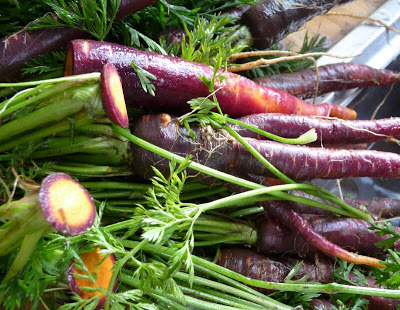 I also dropped a pannier off with my mother who gave me large bundles of vegetables in return – new potatoes, beetroot, carrots (purple ones – see photo), parsley and broccoli. It was quite hard work preparing all of this when I got home. But was rather delighted with the discovery that beetroot leaves make delicious spinach – I knew they were from the same family but have never tried eating them before. There’s a lot of publicity about food waste at the moment. Gordon Brown is urging people to be more thrifty and explaining why chucking waste in the bin is bad for your wallet and for the planet. It’s one of the few things he says that I agree with. And tonight I’m going on Radio 5 Live – The Richard Bacon Show – to talk about it. Growing your own produce and eating it on the spot is the least wasteful approach to food you can get. But even if you do shop at the supermarket there are lots of ways to make the most of what you buy. WRAP (Waste Resources Action Plan) are running a campaign called Love Food Hate Waste. Have a look and see if it helps you. Meanwhile, I’m waiting for the spinach, tomatoes and brassicas from my garden – and hopefully a bit less rain. This entry was posted in BLOG, Done, Farming & Agriculture, Food & drink, News 2008, Waste & Recycling and tagged Farming, Food, Food waste.